A native of Connecticut, USA, Pastor Mark Finley serves as Assistant to the President of the General Conference, appointed at the 2010 General Conference Session in Atlanta. Prior to this he became a vice president at the 2005 General Conference Session in St. Louis, after serving nearly two years as general field secretary at the world headquarters, directing the Center for Global Evangelism. As assistant to the president he continues to work with evangelism and television as his primary portfolio. Evangelism is where he made his mark on the world, presenting more than 200 evangelistic campaigns around the globe in about 100 countries with the resulting baptisms numbering in the thousands. His best known association is as a television speaker for the series Experience Hope a weekly broadcast of the Hope Channel; for 20 years as speaker for the It Is Written telecast; and he became a pioneer of satellite evangelism technology when he launched the first NET evangelism satellite series broadcast in North America in 1995, and again in 1996, 2000 and 2008. He has preached more than 20 NET series broadcasts throughout the world with millions in attendance. He has used his preaching and evangelism gifts to teach others in seminars, field schools and evangelism institutes. He has written nearly 100 books as well as numerous seminar presentations, major evangelistic series sermons, teaching manuals and magazine articles. His recorded seminars and series number about 20 and are available for purchase in various media formats. He also writes a Bible study lesson published monthly in Adventist World and has been principal author of the Sabbath School Quarterly on more than one occasion. Pastor Finley and his wife, Ernestine “Teenie” have teamed up in ministry throughout the years. Teenie is known world-wide for teaching Natural Lifestyle Cooking and has authored a cookbook, instructor’s manual and workbook sharing her down-to-earth approach to nutrition, conducting evangelism training seminars, health expos and cooking classes across the world. 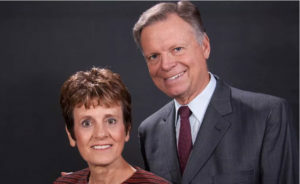 Together they have been involved in Christian ministry for over 40 years- preaching, teaching and offering spiritual growth workshops, conducted over 100 evangelistic series that have spanned the globe with sermons translated into over 50 languages. In April 2016 the evangelism training center was opened in Haymarket, Virginia. This location is the base from which Pastor Finley and Teenie continue the ministry they have conducted in over 100 countries world-wide. Classes focus on the Christ- centered Biblical principles that the Holy Spirit has guided him into in evangelistic proclamation and church growth with younger pastors. In 2016 alone they shared spiritual food to over 200 pastors and lay people. In addition, the training center and Southern Adventist University have partnered to established a Master’s Degree in Comprehensive Evangelistic Outreach and Mission. Over the years, Pastor Finley and Teenie have adapted their ministries and their message to take advantage of the powerful impact of TV, radio, social media and the Internet. This is evident in the popularity of their HopeLives365 Facebook page, HopeLives365 Youtube channel, and the international HopeLives365 Online University. Together they share a family of three grown children; Deborah, Rebecca and Mark Jr and five adored grandchildren.